God now a physicist hacker??? STANFORD UNIVERSITY, California (3/24/14) – Reading the news is a unique adventure these days. It can be a bit entertaining to maybe nibble on, but never to mindlessly digest. To do so has proved to stimulate internal disruptions resulting in irritable bowel syndrome. The creative art of news reporting and atheistic commentary can be downright fascinating if you have the stomach to swallow it even though it is better not to. Today's news had a headlined story titled: "Turkey Shoots Down Syrian Plane." We do have a wild turkey problem out here in the East Bay but they are not that mean. Another in today's news, during the wildest coldest winter of all that pounded us this year (with yet another snow and ice storm barreling down beginning on the first day of spring), was wisely analyzed by AOL news scribe Valerie Conners, with the conclusion that it is, "All due to warming earth." Al Gore would be proud as he polishes his Academy Award for producing an ice- slick documentary about the subject of "Global Warming." The Stanford scientist, Andrei Linde, bases his theses on: "In the beginning, there was nothing. And then, in an explosive instant; Everything." We suppose this should be immediately considered since most people believe that nothing can be formed from nothing. NEWS FLASH! There was indeed a Creator of The Universe, and His work IS signed with a monumental work titled, The Bible. His upbringing under Soviet dogma causes him, according to his own statements, "to distrust any single authoritarian system – including monotheistic religions ruled over by a single God." 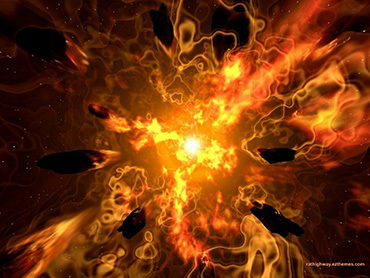 Purporting to have discovered the waves of 13.8 billion years ago that are still floating around over the South Pole, he determined that the first tremors of the Big Bang took place "a trillionth of a trillionth of a trillionth of a second." That's some real calculating to consider. According to the story in The Times, he said, "It is a stunning notion: In a brief blinding pulse, all the matter there is, or will ever be, was produced." And remember that all came out of nothing. Even scientific star Carl Sagan had to admit he had no idea where the original gasses came from that collided and caused the Big Bang that caused us. Seeing a possible flaw (really!) Mr. Linde proposed an "improved theory called, "Chaotic Inflation," which, he says, "creates a self-reproducing eternally existing system of many universes." This theory," Mr. Linde boasts, "was just pure, from nowhere," as he explains further, "and suddenly, I had the theory of eternally expanding inflationary universes, unceasingly – producing new universes, of which ours is but one of many. It was just pure, from nowhere," he postulated. It is to be noted that Stanford Scientist Andrei Linde DOES believe in a Creator. In 1986 Linde developed the theory of "eternal chaotic inflation, which CREATES, a self reproducing eternally existing system of many universes." (emphasis mine) Now we're getting somewhere. This shows he has to have faith. It is amazing how nothing can produce anything much less everything. And if there was NOTHING before creation, wouldn't that include....space? As for me and my house, we'll stick to the 'signed work" of the creation by the Creator.